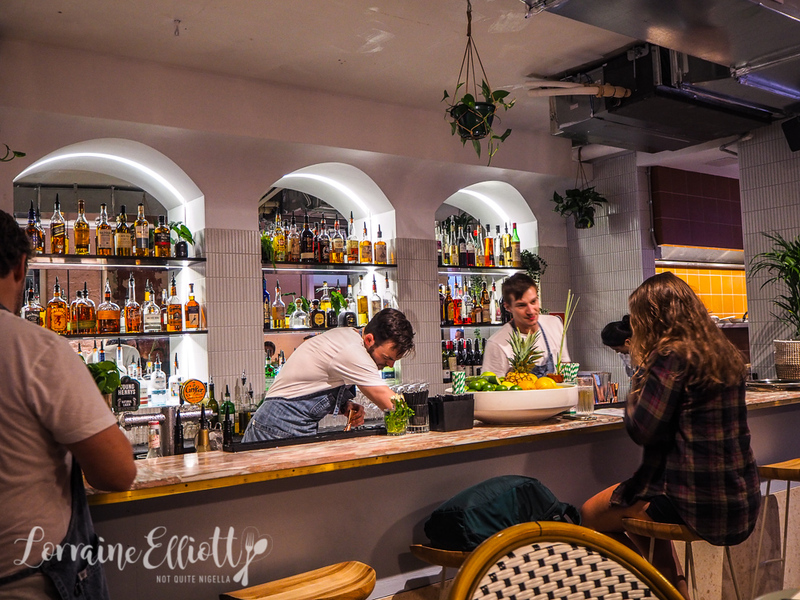 The Charleston is the latest restaurant opening on Glebe Point Road and as the name suggests, involves a Southern American theme. The Charleston promises traditional and modern Southern American fare plus a great cocktail list. 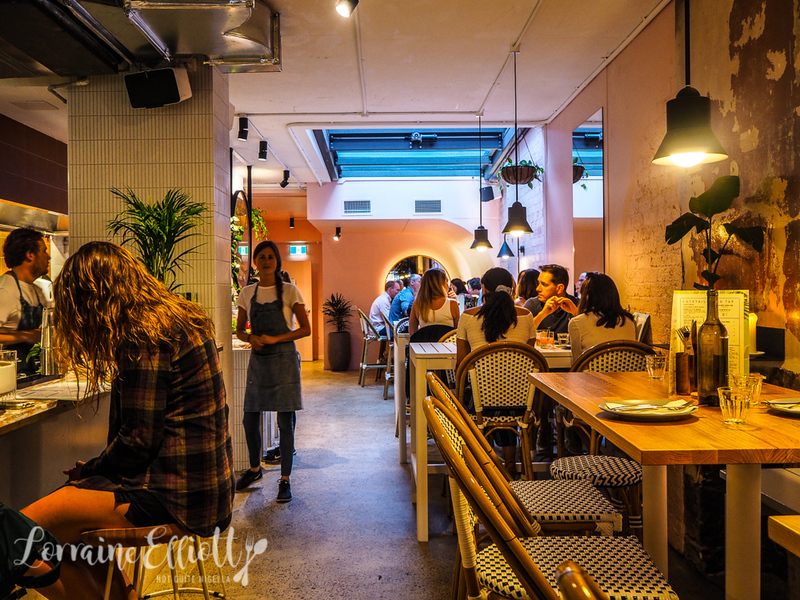 We've been to The Charleston before when it was La Boheme during our schnitzel challenge but they've redone the space well and gone is the boxy element and many of the non support walls. In its place is a spacious contemporary space painted dusty pastel pink with a pink marble bar. I figured the best people to visit The Charleston with were Southerners Ivy and Ryan. It's a gorgeous warm night so we take a seat in the outdoor courtyard area. 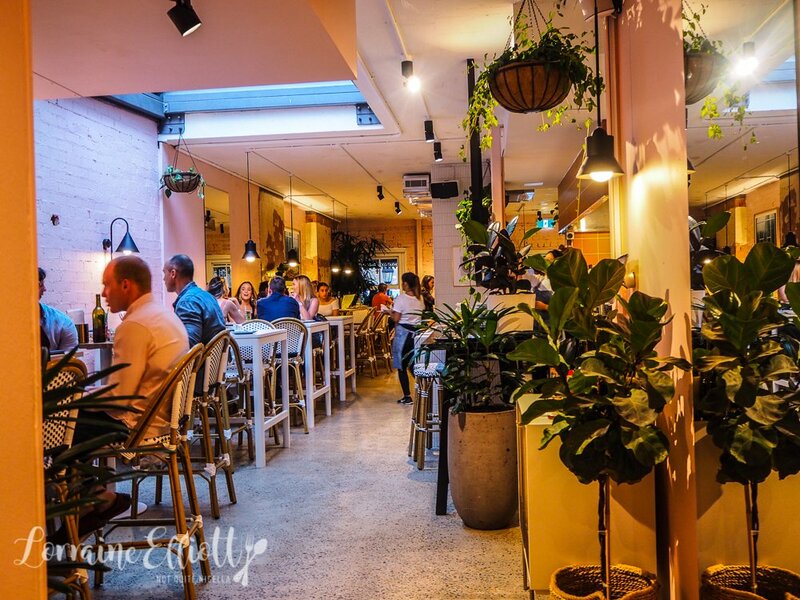 The owners Rob Teitzel and Osman Misirlizade also own The Cottage Bar & Kitchen in Balmain. 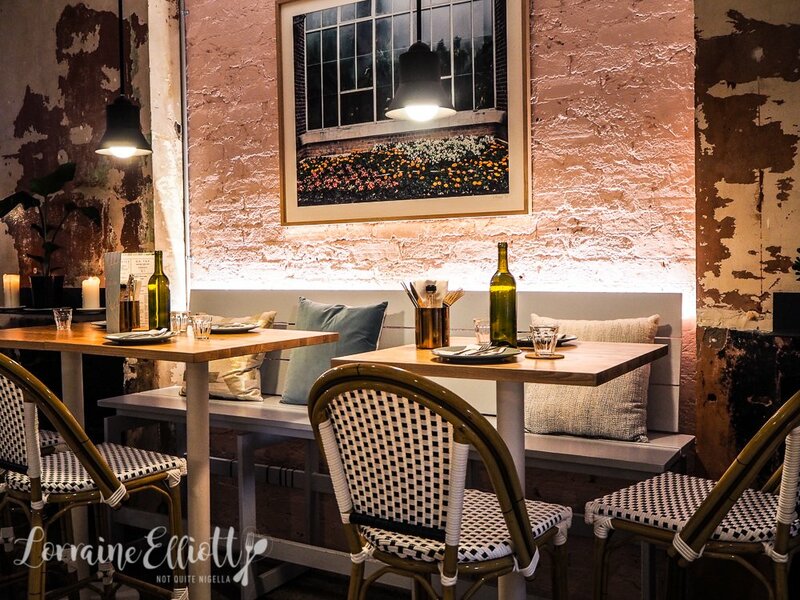 The menu was designed by head chef Ellena Kim who has worked at The Morrison and Uccello. But because it's a Saturday night our first stop is a cocktail. The cocktails here are definitely a feature and there's a nice list of signature cocktails to choose from. 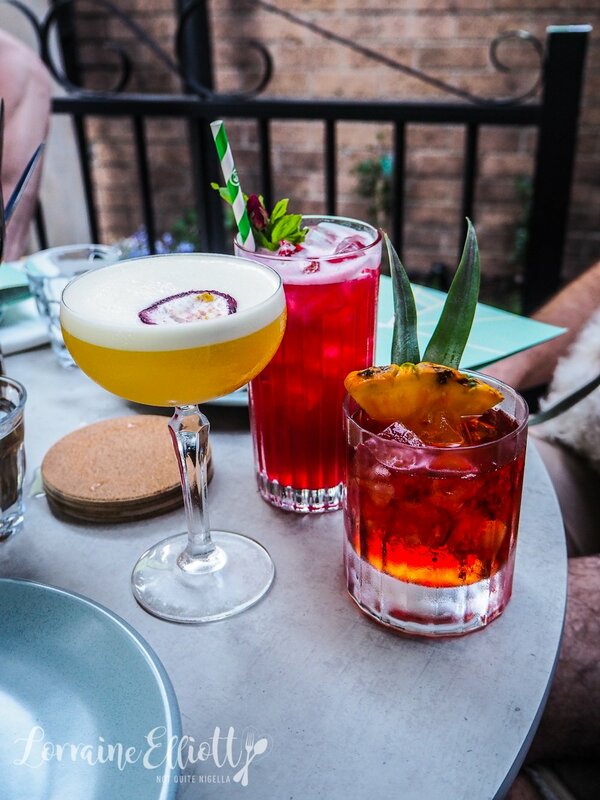 It's a Remember Me in the Morning for me, a Charleston Sling for Mr NQN and a Plantation Negroni for Ivy while Ryan has a beer. I adore my cocktail made with passionfruit, vodka, peach and vanilla liqueur, peach bitters and orange and lemon juice and refuse to let Mr NQN finish it for me (I'm a lightweight when it comes to alcohol). 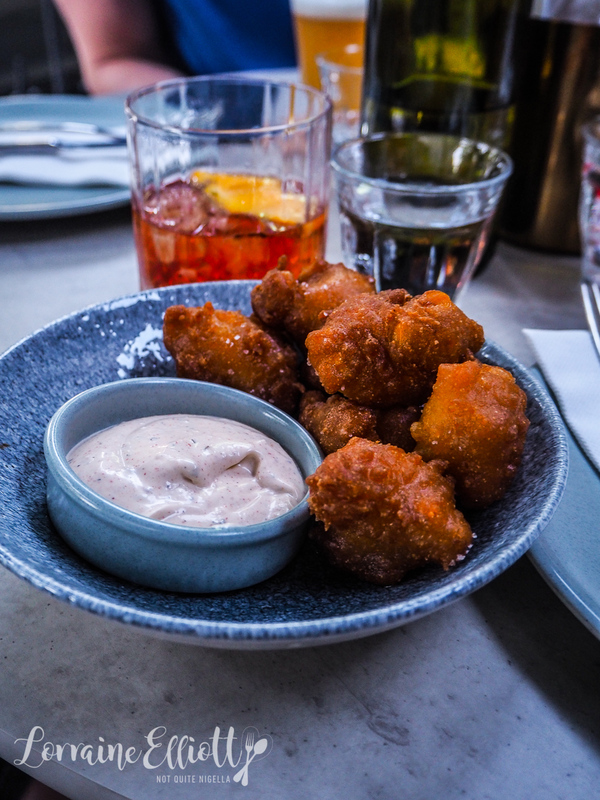 Food wise we start with the hush puppies, drops of cornmeal batter that are deep fried and served with a Cajun dipping sauce. They're quite good, a bit bigger than I've had in America but satisfying. Now pricing a lobster roll at $42 is a big risk. People will inevitably expect a lot. It also says that there is 200 grams of lobster in the roll. I didn't have a scale but it doesn't really feel like 200 grams of lobster. It's really three medallions of char grilled lobster that is a bit on the dry side. The apple remoulade is generously portioned and the milk roll itself is large (it's dubbed a luxe milk bun but I'm not sure what that means) but we all feel that there isn't enough lobster in it to really justify the price. 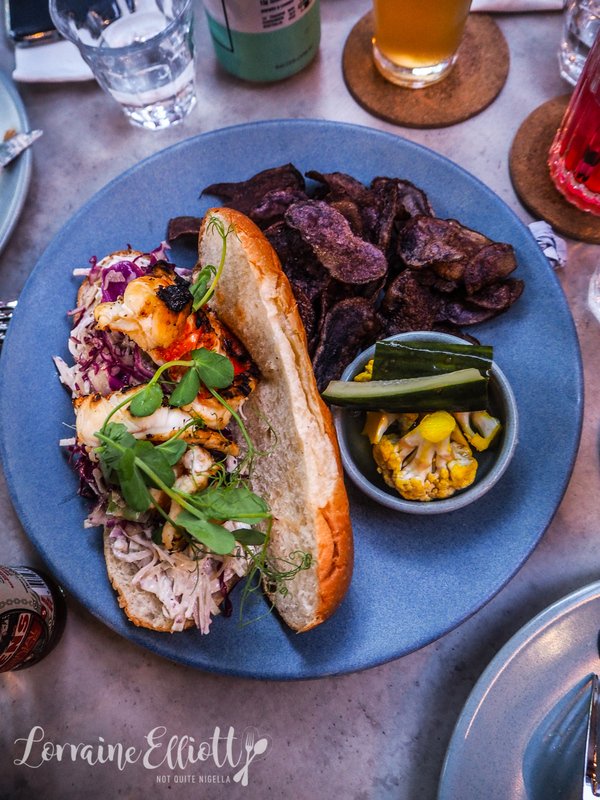 The sweet pickles on the side and the purple potato chips are a good accompaniments but the price is on the high side for the amount of lobster. Similarly, we couldn't really get on board with the Southern fried chicken. In fact Ryan blurts out, "Where is the rest of it?" when it is set down (which admittedly confuses our waitress). 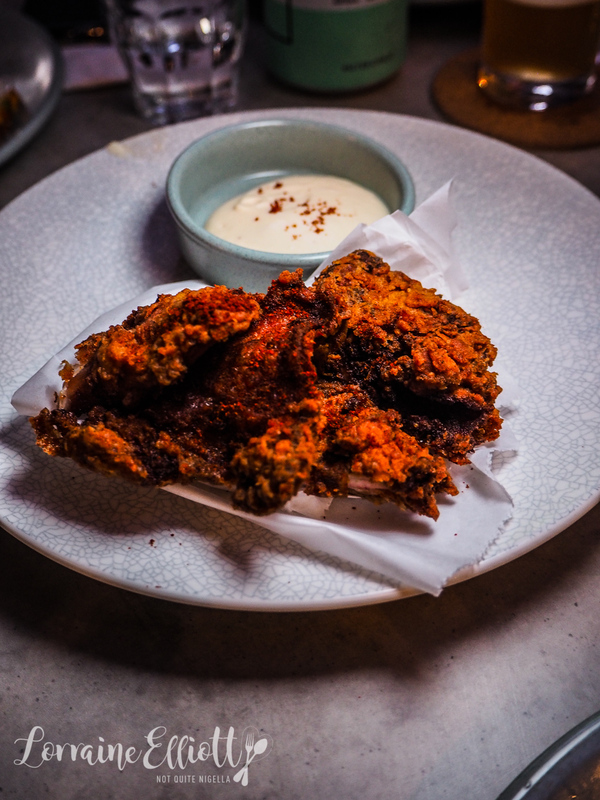 It's unlike any other Southern fried chicken we've ever had. It's flat pieces of boneless chicken and honestly it's confusing. I really hope they re-work this. We shared some tacos-one of each on a corn tortilla. 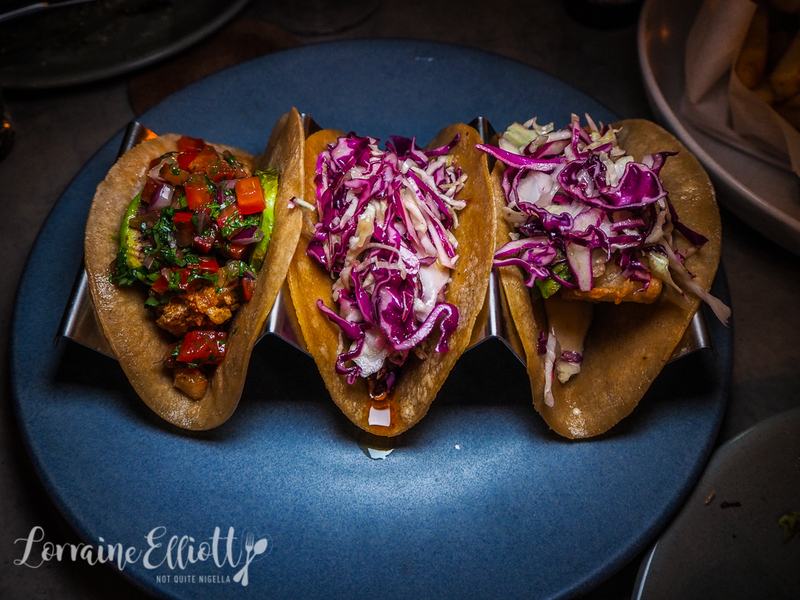 There is a cauliflower popcorn taco with salsa, beans and avocado as well as a battered fish fillet with cabbage, avocado and jalapeno mayonnaise. Lastly there's a pulled pork taco with Cajun spice, chipotle mayo and slaw. The pulled pork is definitely our favourite of the lot as it has the most flavour while the others need a bit more pep and seasoning. 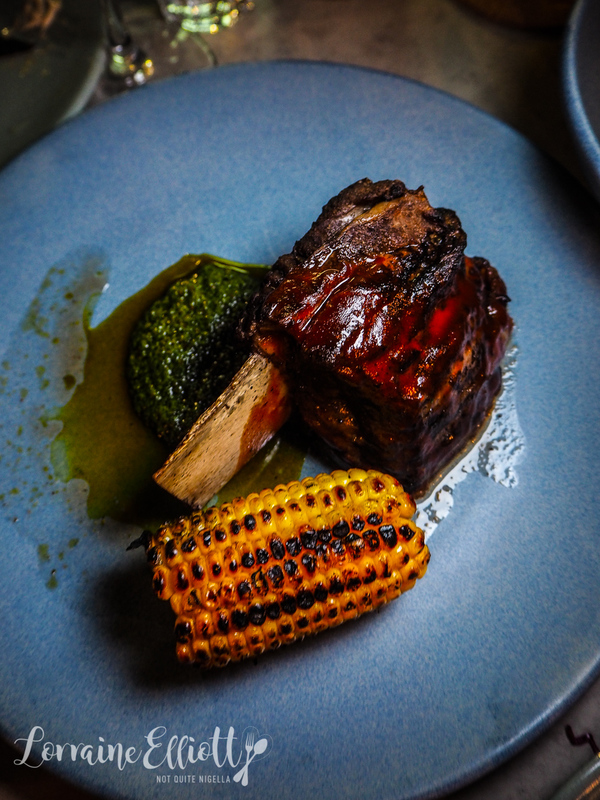 The beef short rib is served with chimichurri and a cob of charred corn. The chimichurri is delicious and we all like it with the beef short rib. The rib itself could use a bit more time in the oven as it does resist cutting attempts. 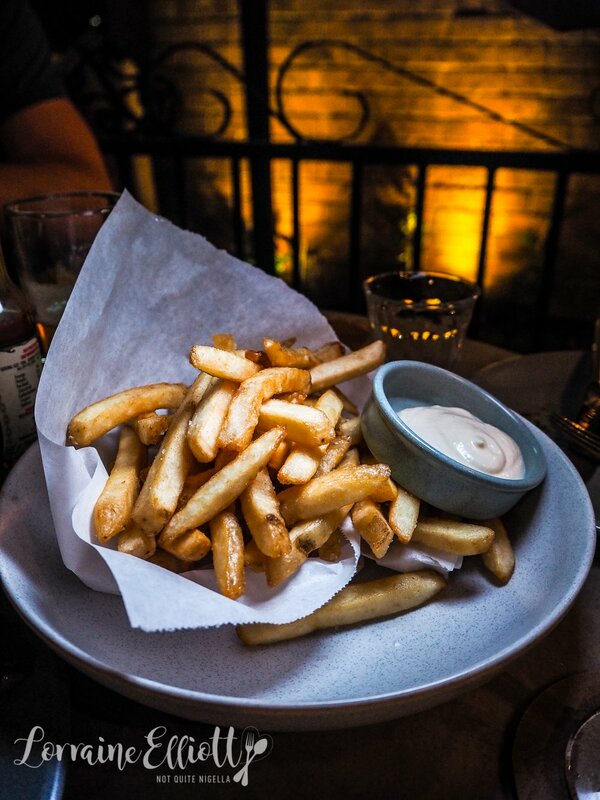 I added a last minute order of fries to the order because we all love fries and I can't seem to enjoy beef without some sort of potato accompaniment and everyone dives into the crunchy golden, crispy fries. There are three cobs to a serve so with the beef short rib that meant that we got one each. 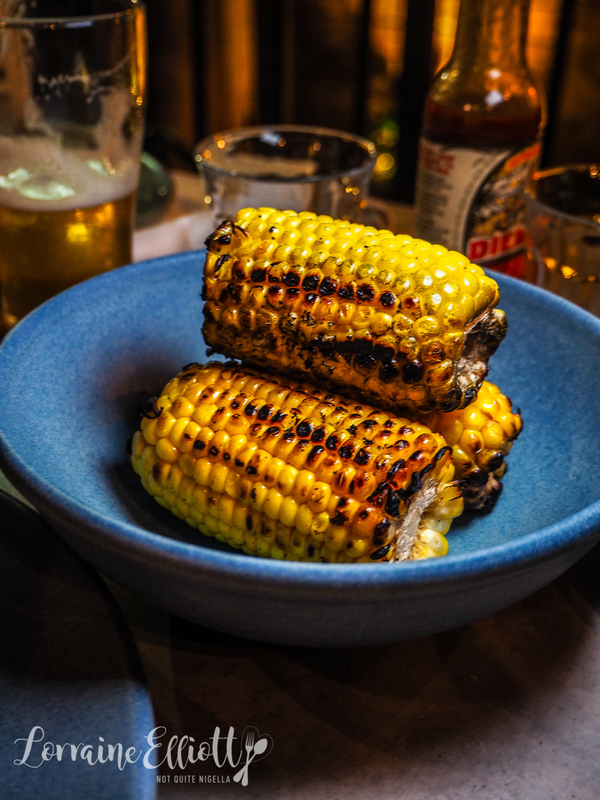 The corn is appealingly charred and juicy. And what Southern meal is complete without mac and cheese? 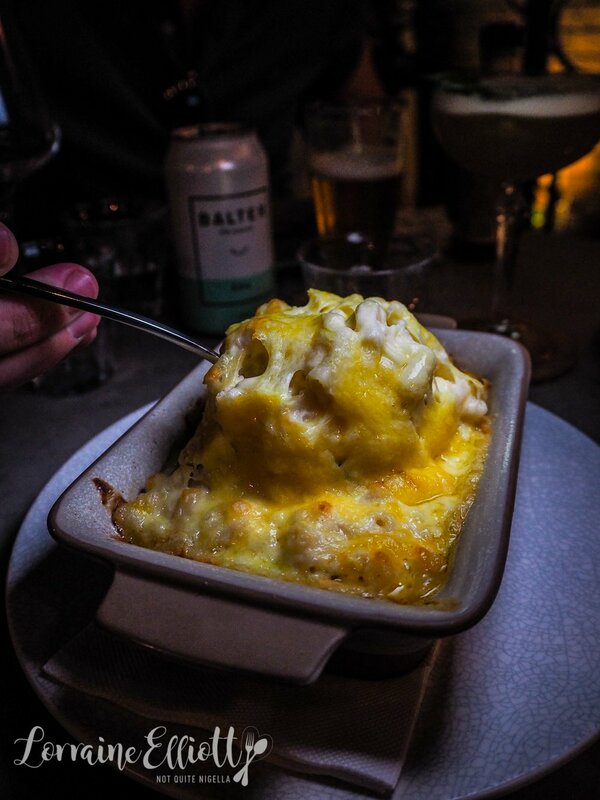 It's a rich, creamy cheesy mac and cheese and quite satisfying and would go well with a lot of the mains. 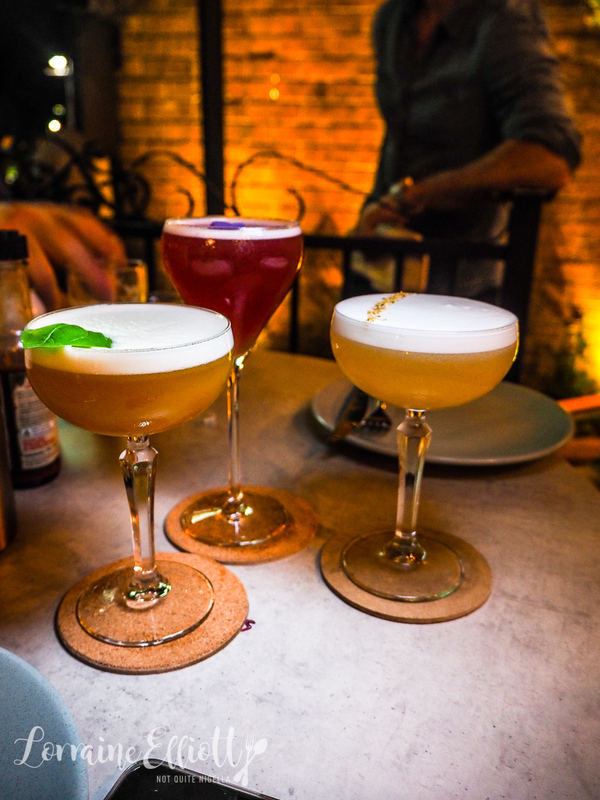 We have another round of cocktails because we are in a festive mood and don't have to rush off to collect Mochi early. This time it's a Chamomile Sour, Jerry's Juice and French Quarter cocktail and we have a bit of a pause before dessert as we're quite full. It's hard to pick a favourite and while we weren't quite sure about some of the food dishes, all the cocktails were a resounding hit. There are two desserts on the menu. The first is an ice cream sandwich described as chocolate caramel fudge with peanut butter, honey toffee malt. 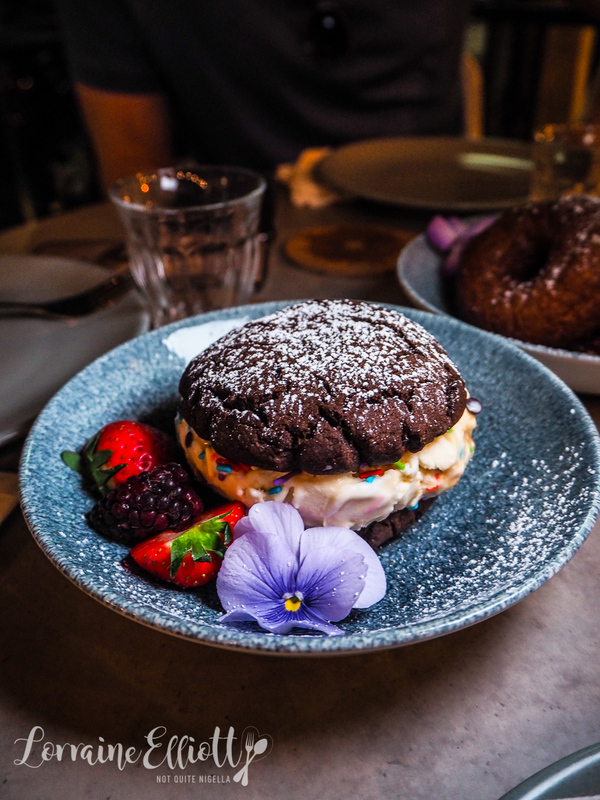 I'm not sure if they changed it but it was a super chunky chocolate cookie filled with a funfetti vanilla and caramel ice cream with chunks of white chocolate in it. I liked the ice cream part but the cookie was a bit too thick and short for the ice cream. The donuts are everyone's favourite and honestly it would have been great if they'd told us that there were three to a serve and we could have paid extra for a fourth. 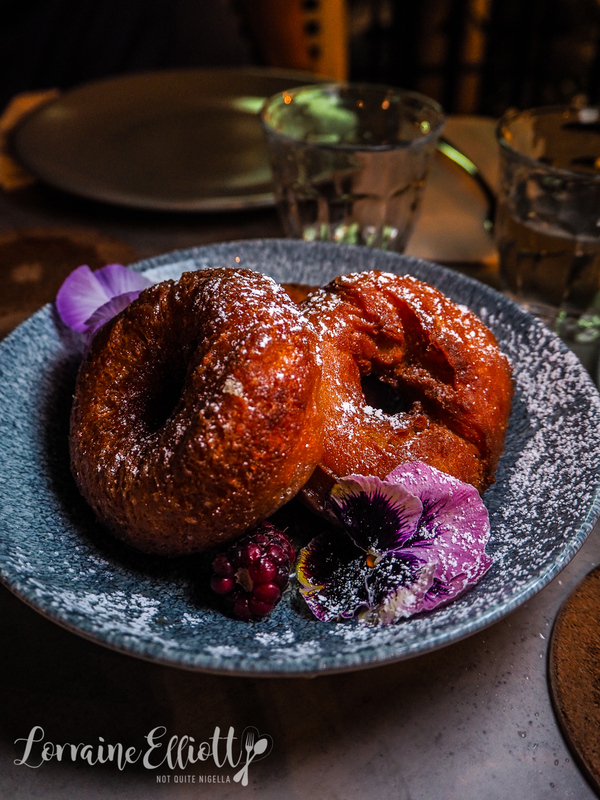 They're served in a sticky bourbon glaze syrup and are buttery good and remind me of loukoumades or Greek honey syrup donuts. And for people that like to go to bed earlyish, we end up leaving around 11:30pm! So tell me Dear Reader, what time do you usually stay out until on a Saturday night? Would you order a $42 lobster roll? Do you like Southern American food?